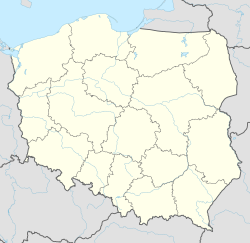 Kętrzyn [ˈkɛntʂɨn] ( listen) (German: Rastenburg ( listen); former Polish name: Rastembork), is a town in northeastern Poland with 28,351 inhabitants (2004). Situated in the Warmian-Masurian Voivodeship (since 1999), Kętrzyn was previously in Olsztyn Voivodeship (1975–1998). It is the capital of Kętrzyn County. The city was named after Wojciech Kętrzyński in 1946. The original inhabitants of the region were the Balt tribe of the Aesti, mentioned by Tacitus in his Germania (AD 98). The town, known in German as Rastenburg and in Polish as Rastembork, was established in 1329 in the State of the Teutonic Knights and was granted town rights in 1357 by Henning Schindekop. Rastenburg and the surrounding district was the scene of the First World War's First Battle of the Masurian Lakes and Second Battle of the Masurian Lakes. During the Second World War Adolf Hitler's wartime military headquarters, the Wolfsschanze (Wolf's Lair), was in the forest east of Rastenburg. The bunker was the setting for the failed assassination attempt of the 20 July plot against Hitler. In 1945, the area suffered devastation from both the retreating Germans and advancing Soviets during the Vistula-Oder campaign. Some ruins of the Wolfsschanze remain. The town was a Wehrmacht garrison town until it was occupied by the Red Army on January 27, 1945. After the war, the town was transferred to Poland under border changes promulgated at the Potsdam Conference. Its surviving German residents who had not evacuated were subsequently expelled westward and replaced with Poles. The town was renamed Rastembork in 1945, and in 1946 to Kętrzyn after the Kashubian historian and activist Wojciech Kętrzyński. Karl Bogislaus Reichert (1811–1883) German anatomist, embryologist and histologist. Dietrich von Bausznern (1928–1980) was a German composer, cantor, organist and music teacher. Krzysztof Kononowicz (born 1963) is a former candidate for the office of mayor of Białystok and notable internet celebrity. ^ Maria Malec (2002). Słownik etymologiczny nazw geograficznych Polski. Wydawn. Naukowe PWN. p. 122. Retrieved 4 May 2012. Wikimedia Commons has media related to Kętrzyn. Wikisource has the text of the 1905 New International Encyclopedia article Rastenburg.